Ask fellow campers about "Burchfield Branch Park COE" and nearby attractions. Another excellent COE park. This park is best for those wanting to fish, but the campsites are fine. There are two sites—wooded area and waterfront. Sites have water and electricity. Bathrooms are clean and showers are clean, heated and plenty of hot water. Getting here is a stretch—the park is well over half an hour from any town. There was no cell signal at all in the campsite—five miles up the hill you could access cell. We camped at Burchfield Branch Park COE in a Motorhome. There are two distinct areas of this campground - the "river front", and the "creek side". The river front sites are right on the Black Warrior River approximately a mile downstream from Lock 17 dam. These sites are all back-in, or head-in, and most have a deck extending out toward the river. Fishing is possible, but not practical at these sites because of the shallow water and logs near the shore. However, it's a great place to launch a kayak or pull up a bass boat. The other area of the campground is up a hollow perpendicular to the river, with most campsites situated around a creek which runs down through the hollow. This area is old growth forest with a very heavy tree canopy. Sites for both areas are flat and level with concrete pads. The lengths given on the Recreation.gov website are accurate for the entire length. We stayed on site 4 on the river front. This site is situated for back-in with the awning side toward the river, but there is a retaining wall that limits the width of the site between the wall and a deck post. We were able to park a triple slide fifth wheel in the space, but could not walk between the body of the trailer and the deck post - use caution if selecting this site. Sites 3 and 7 are situated for a unit which can be pulled straight in, such as a class A or C (and still have the awning side toward the river). There are a mix of back-in and pull-thru sites in the "creek side" area. There is NO CELL PHONE coverage in the campground! OTA reception is limited to just the river sites. Satellite reception is very limited in the creek side sites because of the heavy tree canopy. Bathrooms are very clean and the showers have real mix valves - no push buttons. There is only one full bath house for the campground (37 sites). Two playgrounds, a beach with shower house, several fishing piers and a good dump station. Water pressure was very good, lighting at night was limited to the bath houses and bridges. We camped at Burchfield Branch Park COE in a Fifth Wheel. Closest convenience store is 4 miles, closest real grocery store, and fuel, is 20 miles. We have stayed here quite a few times. We love it. Quite and relaxing. Water front sites are really nice. 2, 3 and 7 are backwards so your camper faces woods instead of water. That's my only complaint. 8, 6, 5, 4, 1 are very nice level pads. Park is beautiful. FYI, if you want cell service or TV, have satellite or WiFi. That for me is great, no phones really helps you to unwind. Park is well kept. Too many logs in water in front of camp sites but not something that will keep me away. The place is beautiful. We camped at Burchfield Branch Park COE in a Travel Trailer. We stayed in a back in site, right next to the water. We were able to put our kayaks in right in front of our site. The pad was level. The only "issue" was because of the wood railing we could not use our grill on the back of the camper. It is on a swing arm, and the rail was too close. No problem for use, we used the fire pit and cooked inside. There is a charcoal grill located at the site. We didn't use it. Nice deck and picnic table. Nice swimming area, nice playground, and boat ramp available. We camped at Burchfield Branch Park COE in a Travel Trailer. There is a small country store a couple of miles from the entrance to the park, other than that it is 20 miles to the nearest stores. Wonderful all around! We had a great time. This park was awesome and clean! Lot neighbors were nearby. Site was gravel featuring a fire ring and picnic table. Some sites were sunny and open, and some shady. We camped at Burchfield Branch Park COE in a Fifth Wheel. COE Park along the river. Sites are well spaced and pad very level. Plenty of shade trees. We stayed in site 35 in the woods. Also they have 8 sites that back up to the river with deck overlooking the water. Site and entire park very clean. Showers and restrooms spotless!! No Verizon cell service and only 1 on air channel but made it a very peaceful weekend. We would stay again. We camped at Burchfield Branch Park COE in a Travel Trailer. Get supplies before you go. Nearest large stores 25+ miles away. Burchfield Branch Park is located near Adger, AL and provides great access to Holt Lake on the Black Warrior-Tombigbee Waterway northeast of Tuscaloosa, Alabama. The Black Warrior-Tombigbee Waterway consists of six lakes with a total length of 457 miles and 39,800 surface acres of water. This facility also offers great amenities, access to the water, limited hiking trails, and opportunities to view wildlife. Water front sites are numbers 1 through 7. Best site on the water is 6. Stay away from site 4 as it is configured incorrectly with hook ups on the wrong side of the RV. If you opt for the waterfront sites beware that the nearest full service bath facility is a little bit away. There is a toilet at the entrance to the loop, though. Both facilities were always in a high state of cleanliness. Don’t forget anything as the nearest respectable “Resupply Center” is far. There is a small country store at the turn off to Lock 17 Road. This is really a nice place to get away from it all. I had no cell phone or TV coverage. This was my second visit and the service/facility was consistent. Cost per night $11.00 with the geezer pass. We camped at Burchfield Branch Park COE in a Travel Trailer. This is one of the prettiest campgrounds we have ever been to. The people who work at the campground are very friendly and helpful. The bathrooms were spotless, the entire park is very well taken care of and well managed. On one of the days we were there the weather was bad, we heard a knock at the door, it was one of the hosts with an umbrella guiding us to a brick building with no windows. We certainly appreciated that. A tip is to bring all your supplies with you, it's a long trip to a Wal-Mart. We camped at Burchfield Branch Park COE in a Fifth Wheel. It is a very nice park, clean and quiet. We stayed on Site 6 right on the water. There was a nice deck right out my front door. Sites 1 through 8 are river front and the rest are off the river. Sites 6 and 8 seem to be the best sites on the river. I would have given the park a solid 10 rating, but no internet or phone (cell) service. I know it’s camping, but some of us still are working. It should not be that difficult nor expensive to run Wi-Fi. Bring everything you need as it’s a long way to the Wal-Mart in Hueytown. We camped at Burchfield Branch Park COE in a Travel Trailer. I cannot think of anything bad about this Park. Every one we talked there running the park were the nicest we had meet. Lots of good views. Nice small creek runs behind most camp sites. Lots are very wide and level but fit a 40ft RV easy. You will love it here. We camped at Burchfield Branch Park COE in a Fifth Wheel. Stayed in site 4 on the water which was a tight fit for the slides on the fifth wheel but manageable. Beautiful views of the river with the leaves just starting to turn. The park is a bit out of the way which isn't a bad thing. Our guests had to walk about 3/4 of a mile to the camp site since they arrived after 10:00 PM which is when the entry gate is closed. Would be nice if they could install a gate with key code access. Very nice park. We camped at Burchfield Branch Park COE in a Fifth Wheel. Wow, this is a beautiful park! Very nice campsites with lantern hanger and decks. US Army Corps certainly did this one right! Very nice, very clean bathhouse with roomy showers. One of the camp hosts has property nearby and raises free-range, happy chickens. When you are here, ask him to sell you a dozen farm-fresh eggs. Watch carefully and you will see a few groundhogs in the wooded areas of the park. The only thing I didn't like is something that is typical of many National or State parks: neither my cell phone nor my wireless internet would work. Even with those issues, I will return to camp here again We camped at Burchfield Branch Park COE in a Motorhome. A very nice COE park on the river. The park is a long way from any major town and is very remote. There are 8 sites on the river. The balance of the sites are in a wooded area along a creek and are very shady. Some are very private and some not so much. Some sites have wooden decks overlooking the river or the creek. These are especially nice. The bath house is the best and cleanest I've ever seen at a campground. The entrance road is very steep so be sure you've got enough brake and engine to deal with that. We camped at Burchfield Branch Park COE in a Travel Trailer. Our latest visit to this great little park was no different than previous visits. The hosts are extremely polite and the park is very well maintained. We stayed on the water and really enjoyed ourselves. Definitely worth the trip out here. We camped at Burchfield Branch Park COE in a Fifth Wheel. Another great Army Corp of Engineers park! There are eight waterfront sites. The remainder are hillside sites with a creek winding through them. You do not have a view of the river from the hillside sites. All sites have paved pads, picnic tables, lantern hook, grills and fire rings. 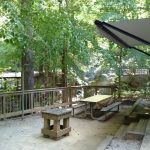 Some sites have decks that overlook the creek that flows by. The majority of the sites are shady. Although there are seven first-come first-serve sites, I would have a reservation before going. We camped at Burchfield Branch Park COE in a Motorhome. Are you affiliated with Burchfield Branch Park COE ?